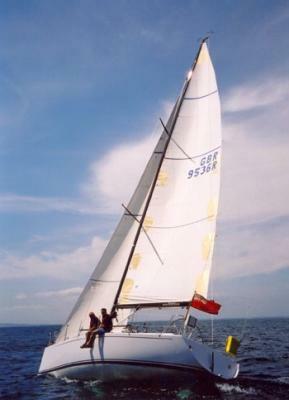 37′ Cruiser/Racer for an experienced owner with big wins at Cork Week 2002 and the 2005 Fastnet. A great looking boat, she is a testament to the combined talents of all the parties who got involved in the e-mail circulars discussing every aspect of the boat: Owner Rob Boulter, John Fox the engineer in the US, Donald Wilks of Banks, Nick Harvey and David ‘H’ Heritage of builder 2HO in Hamble near Southampton. 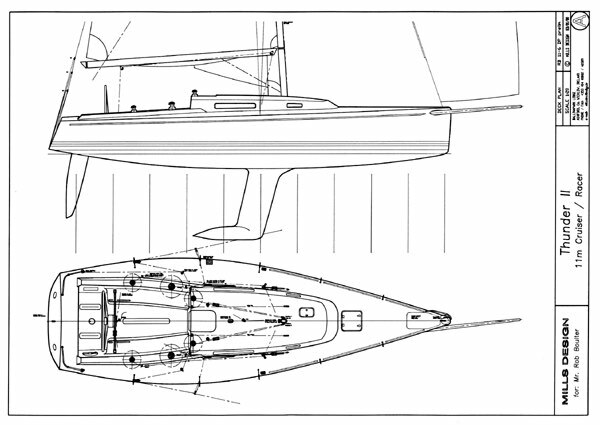 This design is an exciting departure for Mills Design with its swept spreader carbon rig, retractable bowsprit, and light displacement performance cruising emphasis. The combination offers outstanding performance without the need for a full racing crew, a drawback of Rob’s previous very successful yacht Thunder, well known on the South Coast of the UK. 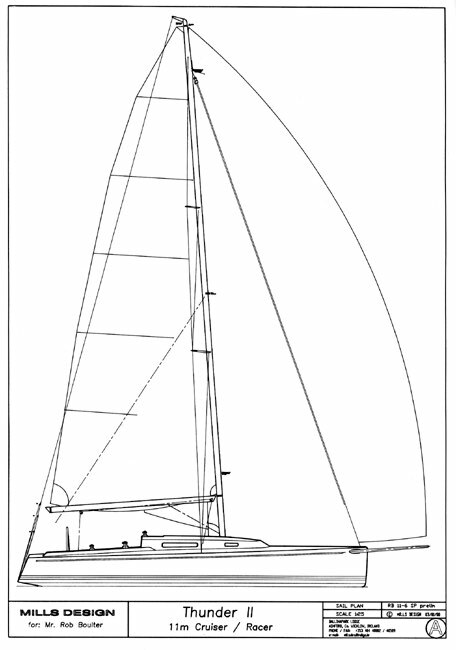 In many ways Thunder II is an example of a newer simpler style of fast yacht with no runners, no spinnaker pole, a simple but functional interior, and a race ready deck layout that also boasts a large diameter wheel, coamings, and cockpit seats. 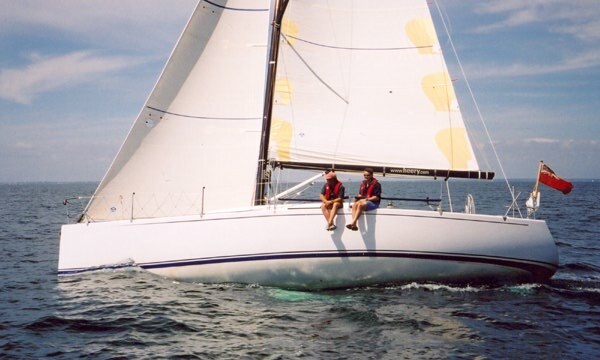 The success of this is shown by her excellent results sailed double handed in the 2003 RORC Offshore Series, and in these pictures from the owner. 2HO built our very successful 1997 36′ design Quokka, as well as the 1999 British Admirals Cup IMS 50 Venture 99. Their skill and experience guaranteed a beautifully finished yacht, built exactly to the engineering specifications of John Fox at FCS. Shown is an example of the sort of rendering available to John while he is designing the structure, in this case using SolidWorks, and highlights the quality of information which comes from FCS. In sourcing parts for Thunder, a large net was cast to find the best suppliers, involving products from France, Sweden and New Zealand. For example, the rudder bearings on Venture 99 from JP3 of France impressed 2HO sufficiently to return to them for this project, while the carbon rig is a new development for the highly regarded Tornado builder Marstrom of Sweden. The design itself uses a high performance hull shape with the parameters slightly adjusted for improved light air performance. This takes account of the slight reduction in the versatility of asymmetric spinnakers set from the retractable bowsprit. 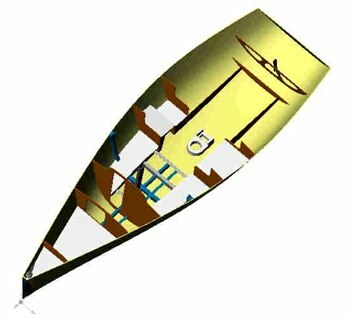 Without the ability of symmetrical spinnakers to run deep Thunder II requires expanded performance in the light air upright condition. The SG iron fin and lead bulb allow us to increase righting moment without having to increase the overall displacement, a helpful factor when trying to accommodate the small weight increase of cedar strip hull construction. On deck low coamings surround the cockpit, cockpit seats offer improved comfort, and wheel steering means every control is at the fingertips of the small crew. 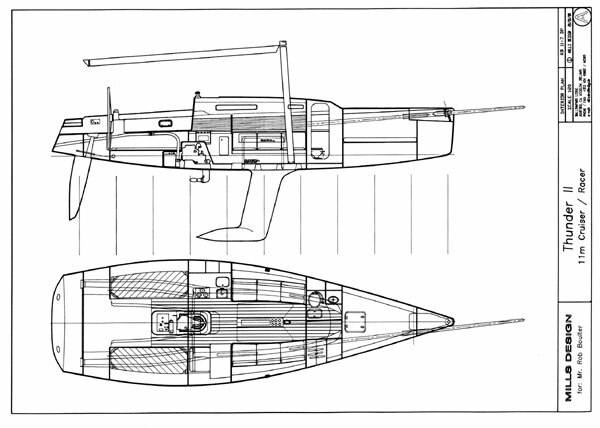 The underdeck mainsheet is a nice touch, as is the recessed roller furler in the foredeck. The coachroof layout has been modified to allow a solid storm hood to be slid over the hatch for better protection on long passages. Down below a conventionally laid out interior provides sleeping for six, with the possibility of increasing that to ten in the future.